Friday, September 18th, 2015, Planet Earth will be treated to an opening round match between the United States and the host nation of the World Indoor Lacrosse Championship 2015, the Iroquois Nationals. This game kicks off 10 days of international lacrosse glory. Lacrosse is booming around the world, but many still don’t know much about the indoor version of the sport, commonly known as box lacrosse. After months of grueling preparation, 13 nations from across the globe will be competing in Syracuse, NY, and at the Onondaga Nation in an attempt to capture a gold medal. Before we glue ourselves to all the action, we should probably brush up on the rules of box lacrosse, or for some of us, learn what the heck box lacrosse is in the first place. These are the rules specific to the FIL and the WILC 2015. First, in box lacrosse there is no offsides. Sure there can be too many men, but cherry-picking is legal and there’s no waiting at the blue line. Another difference you’re bound to notice quickly; there’s going to be plenty of legal (and sometimes illegal) cross-checking. Players do not need to be completely motionless on offense when setting picks and both sides of the ball are allowed to cross-check on, and off, ball. That said, a hard cross-check into a players back or head will send him packing to the penalty box for 2 or 5 minutes, depending on the severity of the foul. Like hockey, playing without the stick is legal, as long as player isn’t using his hands to hold opponents, or the ball isn’t touched by the hand. Pulling the goalie is also common in late 4th quarter and power play situations. Penalty shots are administered when penalties occur to a player on a breakaway, which is always exciting! Unlike hockey, when a ball leaves the area of play there’s no face-off, but the ball is awarded to the team opposite of who touched it last. Oh yeah, did I mention all penalties are like hockey? 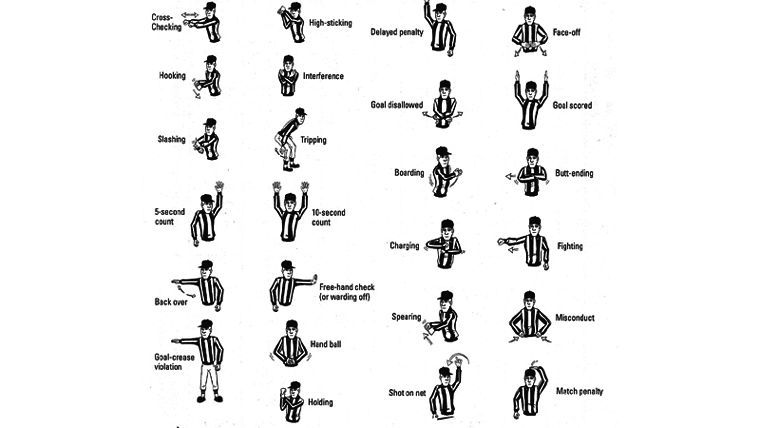 Players serve either a minor of major penalty (or they are issued a game misconduct, but we won’t go there). Yep, you sit either 2 or 5 minutes in the sin bin instead of the typical 30 seconds or 1 minute for field lacrosse. Folks in the box community typically call these moments power plays instead of man-down or man-up. The crease is a bit different in shape and by rule. First, the backside is flat across the goal to give more room behind the net (and to allow for sick dunks!). Second is that the offense may enter crease permitted they’re not in possession of the ball, they don’t touch the goalie, and they’re not first to touch the ball once leaving the crease. Although the crease play is more liberal than field lacrosse, no one from the offense can be in the crease when a shot is taken. Players may dive into or through the crease, but may not make contact with the goalie. On the face-offs, a player may not clamp and hold the ball down, but must pop or rake the ball out of the face-off circle. It can require a very different approach, as the motion is often less forward and to the right, and more forward and to the left. Other players can’t compete in the scrum until the ball leave the smaller circle. Those not facing off start behind the restraining lines and must wait outside the larger circle for the ball to be ejected from the face-off circle. The goalies are padded much like hockey, with large upper body pads and hard plastic leg coverings. The goalie will be squatting in the “down position” to best cover the net, unlike field lacrosse, and may pick up the ball with his hand. Unlike hockey, the goalie won’t spend much time squirming around on the floor. He also will be wearing what look like two oversized lacrosse gloves instead of a blocker and catcher, but will usually keep only one hand on the stick, and keep the stick between his legs, unless he is throwing the ball. 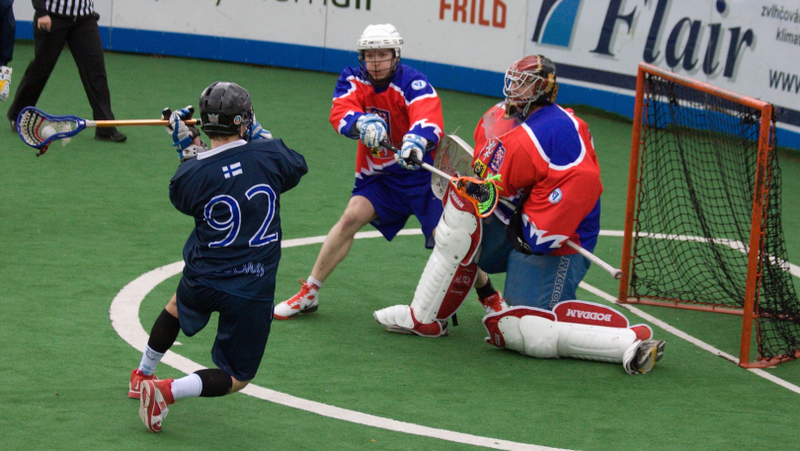 Box lacrosse is played on a drained hockey rink or a similar enclosed area. The floor may be wood, concrete or a variation of turf. Glass is mounted atop the boards surrounding the playing surface. Team benches are located side by side opposite of the penalty box and scorer’s area. All runners use short sticks and typically play on one side of floor (left or right) based on a dominant hand. Depth of the pocket can’t exceed 5″ from the top outside edge of the sidewalls, but you may see daylight over the top of the ball. Pinching the head is also common with box lacrosse, which is legal as long as the ball doesn’t become lodged and can still roll out cleanly. Box lacrosse players typically wear hockey helmets with face masks designed specifically for playing lacrosse. The gloves, elbow pads and shoulder pads are usually the same (or a bit beefier) as typical field lacrosse equipment. In box lacrosse, players typically won’t be caught in a game without wearing hard plastic rib/spine pads along with sturdy bicep guards that are either taped to the top of the arm, or rigged in between the shoulder and arm pads. Both the rib and bicep pads help players deal with all the cross-checking. Mouth guards are a must and some offensive-minded players also toss on wrist guards between the gloves and arm pads. 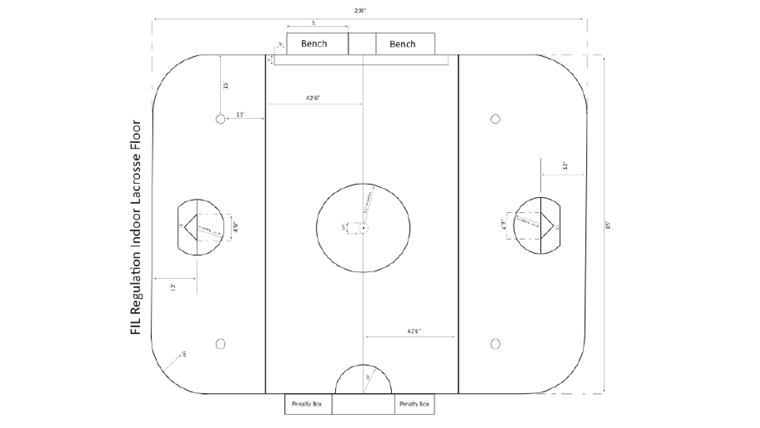 Substitutions are unlimited, occur during live play, on the floor, but close to the boards. A player may not leave the substitution area along the boards until a member of his team has crossed it while returning to the bench. Unlike any other sport, the offense typically subs off completely for the defense to enter floor and vice versa with change of possession, all during live play. I hope our little guide helped you out! If you have any questions on the difference between box and field lacrosse, WILC 2015 rules or all of the above, drop a Q in the comment section below, or if it may seem embarrassing, we don’t judge! 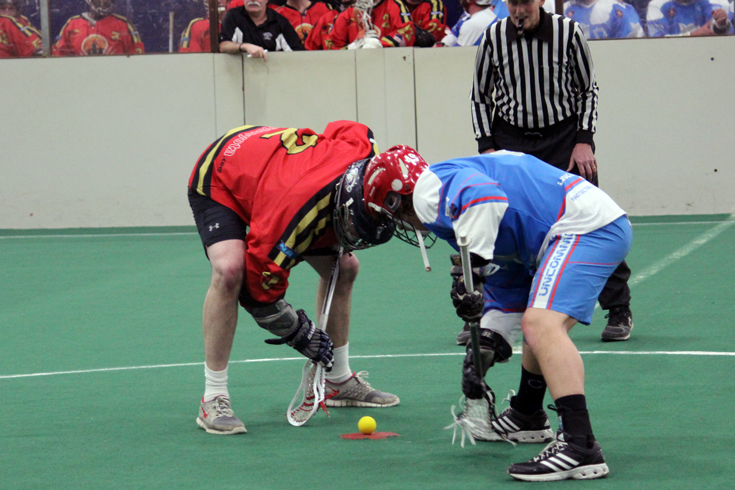 The entire rulebook for the WILC 2015 can be found on the FIL website! I recommend giving it a once over before screaming at the television for a week!